Dr. Christopher's Metaburn Herbal Weight Formula ~ supplies the essential vitamins & minerals needed for proper body function during weight management. * This statement has not been evaluated by the Food & Drug Administration. This product is not intended to diagnose, treat, cure or prevent disease.Description: Metaburn Herbal Weight Capsule is a natural herbal remedy that helps to promote health and weight loss. Obesity is a major public health disorder of the 21st century. Since 1980s, this phenomenon has tripled and the number of obese people, especially children, continues to grow at a troubling pace. About 10 – 13% of deaths are associated with obesity-related diseases. In most cases, obesity is caused by systematic overeating; a decisive role in this process play not the absolute amount and caloric intake, but how much do we exceed our natural body’s needs that largely depend on the energy consumption and are associated with the nature of work, physical activity, food absorption in the gastrointestinal tract and other factors. Imbalanced diet, malnutrition and decreased motor activity may lead to the reduced immunity, metabolic disorders, which ultimately lead to the development of various diseases. To compensate for the deficiency of essential nutrients, healthcare providers recommend high-quality dietary supplements that allow patients to control their body weight and take into account the physiological needs of the organism at different periods of life. Metaburn Herbal Weight Capsule is a complex of natural biologically active substances of plant origin, which optimizes metabolic processes in the body and helps to normalize weight and enrich the diet with beneficial biologically active substances. 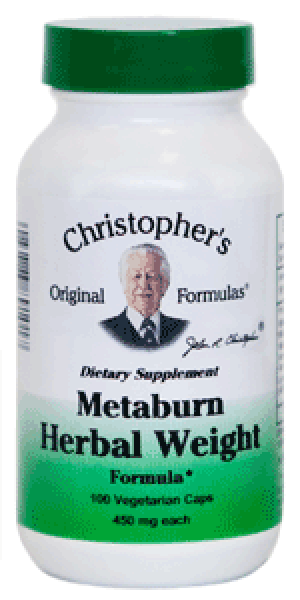 Dr. Christopher’s Metaburn Herbal Weight formula is a rich source of herbal vitamins A, C, B1, B2, E, and P. Vitamin P strengthens the walls of blood vessels and contributes to the accumulation of vitamin C. A large iron content allows for the prevention of iron deficiency anemia after prolonged chronic illnesses. The Metaburn formula is formulated with herbs known for their rich content of substances that have the ability to bind toxins and waste products (heavy metals, radioactive elements) and remove them from the body. This plays an important role in the prevention of some intestinal diseases and speeds up blood clotting. Ingredients: Brigham Tea Herb, Red Clover Blossom, Oat Straw, Damiana Leaf, Chickweed Herb, Juniper Berry, Catnip Herb, Senna Leaf & Cayenne Pepper. Directions: As a dietary supplement take 4 capsules 2 times a day with meals or glass of water or as directed by your health care professional.